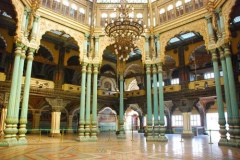 The chaotic legacy of Mysore Palace is mirrored in the fascinating history of Mysore, a city which has seen political turmoil, disaster and destruction but has been rebuilt to become the impressive structure and destination that is in existence today. Mysore is often referred to as the ‘City of Palaces’ although the main Mysore Palace is the one that resides within the old fort. It is the second most visited tourist attraction in India after the Taj Mahal with more than 2.7 million people visiting every year. The current palace is in fact the fourth to have resided on the site. The current structure was built in 1897 after the previous one was burned down in a fire. The original palace is believed to have been first built as early as the 14th century. This was built as part of a wooden fortress which was constructed by the Woodeyars, the royal family at the time. In 1638 the palace was struck by lightening and was rebuilt on a grander scale where it was extended and had new pavilions added. However political upheavals in the 18th century meant that the palace was abandoned and left in a state of disrepair. Under a new command, the palace was once again rebuilt under the rule of Krishnaraja Wodeyar III in 1799. 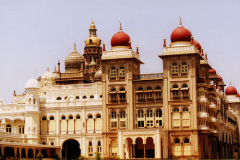 When this was destroyed by fire, a British architect was commissioned to design a palace worthy of the memory and heritage of Mysore and its royal family who had ruled for more than 700 years. The overall aesthetics incorporate Indo-Saracenic, Hindu, Muslim, Rajput and Gothic architectural influences. The finished stone building features three stories, a 145ft five story tower and is constructed from fine gray granite and pink marble domes. A national treasure and the pride of a kingdom, the Mysore Palace now houses a stately collection of important and historical artifacts. The Palace also contains several rooms of significance including the audience chamber, public durbar, royal wedding hall and the armory. 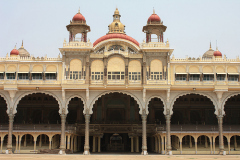 Every autumn, the Palace is the main location for the famous Mysore Dussehra festival where various artists perform on stages within the grounds. On the 10th day, a grand parade with elephants and elaborate floats commences at the palace. 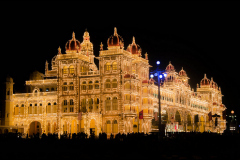 Held during September and October, this is the most exciting time of the year to visit Mysore and get caught up in the pomp and excitement of celebrations. 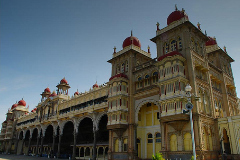 Mysore Palace is open seven days a week from 10am until 5.30pm. On Saturdays, Sundays, national holidays and during the two-month Dussehra festival period, the palace is illuminated by 97,000 gleaming light bulbs to create an ethereal light extravaganza against the ink black sky. There is also a nightly sound and light show from 7pm to 7.45pm.